ISLAMABAD: Pakistan on Friday conducted successful test-fire of short range surface to surface ballistic missile HATF II (Abdali) with the range of 180 km. 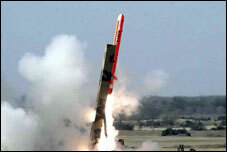 The missile can carry nuclear and conventional warheads. The test-fire of the missile held at undisclosed location and was witnessed by the Chairman Joint Chiefs of Staff Committee General Shamim Hyder Wyyne.